Our everyday reliance on networking has led to a revolution in the AV industry. AV and IT have been converging over the past few years. Right now, network infrastructures are at work to provide the highways for communication that serve up incalculable bits of information for us to consume. Historically, traditional AV distribution typically has relied on centralized equipment racks and the proprietary use of cabling to receive and transmit content, a process that is entirely segregated from networking systems already in place and being used to manage this hardware. Therefore, the advent of video over IP means that the data paths for the application of AV and control over networks are, in most cases, already available and waiting to be tapped! Through video over IP, we are opening the door for a technology that can accomplish multiple roles in AV distribution that previously would have required separate and often bulky pieces of equipment. This changes the landscape of how we integrate AV solutions. In particular, matrixes can gain significant video- and control-signal advantages over their I/O-restricted, centralized hardware brethren. By decentralizing the I/Os and allowing commonly used network switches and time-tested IP methods to handle the flow of traffic, we are enabling real AV scalability. This kind of scalability offers a new and unprecedented level of customization that gives integrators the option to expand any matrix system’s inputs and outputs without replacing major system components. 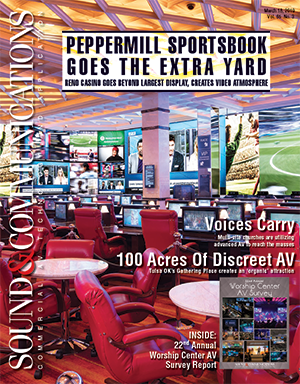 What’s more, we are already beginning to see the benefits of harnessing high-speed network infrastructures for AV distribution in some of the largest vertical markets in commercial AV. The adoption of video over IP in the higher education vertical is beginning to surge. Within this channel, networks need to cover large distances. The interaction between teachers and their students is integral to the learning experience, and video over IP can enhance this interaction through an asset-sharing system. 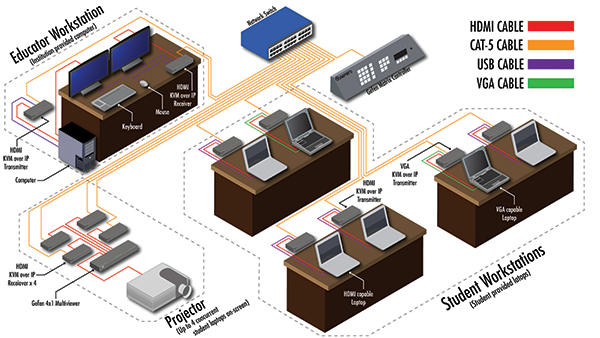 With a properly deployed video-over-IP solution, student and institution-provided computing solutions can be connected easily in an ad-hoc manner. Educators will be able to assess each student’s progress at their own station, and even share this with other students on projectors quickly and as needed. The real-time interactivity has the capability to create an organically interactive learning environment. Additionally, the versatility of a scalable solution goes beyond just the student-professor interaction. In every school, exacting needs can be deployed in each classroom. Video equipment can be shared between departments with ease, along with centralized content management and monitoring. Campus-wide signage, typically networked, can leverage video-over-IP equipment to share messaging without the reliance on locally based players. Video over IP is also well suited for the corporate environment, in which reliance on networks means that cabling and equipment are primed for the introduction of this technology. For example, I visited the headquarters of an innovative company where management was beginning to push for collaboration on a smaller, more intimate scale. Employees were encouraged to engage at each other’s workstations, to share their progress in a more organic fashion instead of congregating in conference or huddle rooms for daily interactions. This does not mean that conference rooms were irrelevant, but their use was now focused on private meetings and executive or team presentations. To make this vision a reality, the company fully integrated every employee’s workstation into a video-over-IP network. In the new system, each workstation is integrated into the video-over-IP network, along with a control layer. Employees can now walk to the desk of a fellow team member and share their own workstations with the simple wave of an ID tag over a sensor. This tag signals the control system to immediately switch the current video and control interfaces to reflect the identified user’s hardware, regardless of its location within the building. This lets them share their work, sourced directly from their own workstation, on their colleague’s screen. Conference rooms were also outfitted with the same equipment, which means that anyone can immediately share progress with a simple wave of an ID tag. Video over IP significantly changed this company’s culture, and based on the cutting-edge nature of these products, the IT department can easily add new workstations to the network as the company grows. Video and control distribution that takes advantage of high-speed network infrastructures enables scalability, versatility and high-definition content in a way that wasn’t possible before. It is rapidly becoming a growing segment in our industry, and it’s clear that early adopters of this technology that fuses IT and AV will gain a significant competitive advantage in the AV industry.